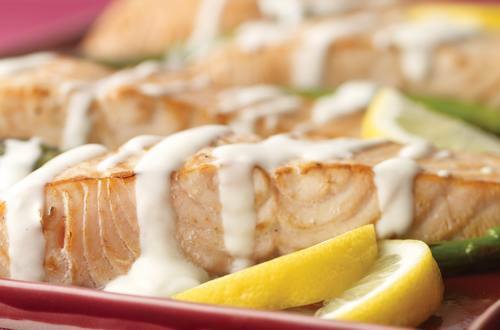 2 Arrange salmon and asparagus on baking sheet, then evenly drizzle with 2 teaspoons lemon juice. 3 Roast salmon with asparagus 15 minutes or until salmon flakes with a fork and asparagus is tender. 4 Meanwhile, bring remaining ingredients just to a boil in 1-quart saucepan over medium heat, stirring frequently. Reduce heat and simmer 1 minute. Serve sauce over salmon and asparagus. Garnish, if desired, with lemon wedges. TIP: To prepare sauce in the microwave, in microwave-safe bowl, combine ingredients as above. Microwave at HIGH 1 minute, stirring once.